Your garage door is a vital part of your home, and it can greatly enhance its curb appeal and security if you make sure to take good care of it. While complex repairs should be left to the experts, there are some tasks you can perform on your own. Completing them on a regular basis will help your door live up to its full potential and reduce its wear and tear. The majority of garage door models are made from relatively low maintenance materials. However, wooden, and sometimes even steel door panels, will require some extra care to keep their visual appeal. Wood needs to be regularly repainting on an annual basis in order to protect it from outside weather conditions. Steel can rust, and so it too may need to be applied with some type of protective layer, especially if you live a moisture-prone area. Aside from the panels, there are other parts of your door that may corrode if they are neglected. 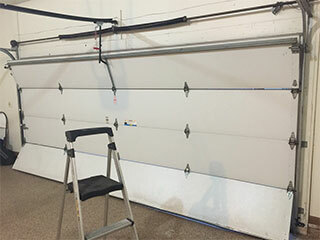 Some parts of your garage door, like torsion springs, steel rollers and the hinges that connect the panels, could greatly benefit from being regularly lubricated. This will ease the friction involved in their movement, and reduce the wear and tear damage they suffer. It's often best to use a white lithium based substance, but be sure to consult your owner's manual to make sure you're only using a product that your door manufacturer recommends. Also, do not lubricate your garage door tracks. Contrary to popular belief, they doing this can actually cause them to become sticky and make hinder the movement of the rollers. Your garage door opener uses a pair of photoelectric eye sensors to prevent it from hitting any person or object that happens to get in the door's path. However, if these sensors are misaligned, they may fail to detect an obstacle properly, which will seriously compromise the safety of you and your family members. To make sure the sensors are working correctly, try closing your door using your opener while there is a cardboard box positioned directly underneath it. If the door closes regularly and hits the box, sensor alignment is required. The photo eyes may even need to be replaced, so you need to have a professional examine them to determine what needs to be done. Our experts at Garage Door Repair New Rochelle will be more than happy to assist you.